“Don’t be afraid to read something you might disagree with,” Alana Raybon told her sixth graders recently, during a lesson on civics and media literacy at their diverse middle school in Nashville, Tennessee. Though Raybon is an English language arts (ELA) teacher, she’s integrating more civics into her class this year as she has watched students struggle—more than ever in her 13 years of teaching—to make sense of current events. In her lessons, Raybon said, she finds herself performing a balancing act to ensure that all viewpoints are welcome at the school, which includes a large percentage of Muslim and immigrant students. That desire—to create a safe space for civil discussion—is a common concern for educators in a period dominated by social media echo chambers, protests over policing, and growing distrust of government among both young people and adults. Some teachers have avoided civics entirely, shying away from topics that might provoke hostility, while others aren’t sure how to make the subject resonate with students. But civics education may be seeing a resurgence as teachers like Raybon work out how to talk to their students in the current political climate, and wonder if a better understanding of civics will help them to do so. Today, two-thirds of elementary teachers report they do not cover civics on a regular basis, after a decades-long decline that some say was accelerated by the No Child Left Behind law, which pressured educators to teach and test math, science, and English language arts to the exclusion of other subjects. 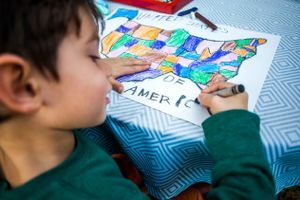 A 2016 report from the Education Commission of the States (ECS) found that most states do not include civics, social studies, or citizenship studies as part of their accountability systems, and only 15 states require students to pass a state social studies or civics exam to graduate. Research also reveals a knowledge gap: Roughly one in four students scored at or above “proficient” on the most recent NAEP civics assessment, in 2014, and adults aren’t faring well either. Nearly a third of Americans cannot name any of the three branches of government, while only a fourth can name all three, according to a 2016 study from the Annenberg Public Policy Center. The findings revealed a significant decline from just five years earlier. With increasing inequality in our society, and the complexity of our political environment, civics education is more important, yet more complicated than it used to be. It wasn’t always this way. The study of civics was once commonplace in U.S. schools: Up until the 1960s, most schools required three courses in civics, two of which explored the role of citizenry and urged students to discuss current events. Civics and civil responsibility were also frequently addressed across many subject areas. But it may not be as simple as bringing back traditional civics courses, according to Kei Kawashima-Ginsberg, executive director at the Center for Information and Research on Civic Learning and Engagement (CIRCLE) at Tufts University. The civics lessons of the past, for example, are often criticized for emphasizing rote learning and underrepresenting people of color. Today, K–12 students are more diverse than ever before, and are also primed to learn through hands-on, collaborative approaches to instruction. Time and demographics have passed the old civics by. CIRCLE’s research indicates that a new innovative style of civics education is emerging, in which students participate in some kind of democratic process rather than listen to a traditional textbook-based lecture on government. These project-based or service learning opportunities, also known as “action civics,” and game-based simulations like iCivics can resonate with youths who have grown up in a more diverse and more technology-centric society than previous generations. The small, middle-class city of Hampton, Virginia, for example, has created civics programming that gives young people the opportunity to interact with and influence local institutions. The city’s Youth Commission—a group of high school students appointed by the city council—has the power to affect city policy in matters related to them. And the principals’ advisory groups—also composed of high school students—help administrators address issues like school safety and academic achievement through a student lens. Other schools and organizations are trying to stimulate civic participation by diverse groups of young people, while encouraging tolerance among an increasingly diverse student body. For Young Whan Choi, manager of performance assessments at Oakland Unified School District in California, action civics means even more to students of color, who typically get fewer opportunities for civic engagement and instruction due to historical marginalization. When we talk about civic engagement in action civics, students are really getting the experience of making change, and that’s not separate from the learning. The learning comes from trying to do something, seeing what doesn’t work, and then trying again. Fueled by his own experiences growing up feeling politically disconnected, Choi has worked with the Oakland district to develop programming in which students learn to engage in the political process. His grant-funded project, Educating for Democracy in the Digital Age (EDDA), helped more than 100 ELA and social studies teachers in Oakland bring action civics inside their classrooms from 2011 through 2015. Choi said the program turns traditional civics on its head—instead of starting by teaching how a bill becomes law, students are asked what local issues they are passionate about improving, for example. By figuring out solutions to real-world problems, students learn how a citizen’s idea for change can turn into legislation. The growth of digital media is also shaping today’s civics education, as more schools try to address emerging issues like fake news and the influence of social media on politics. Research from the Civic Engagement Research Group (CERG) at the University of California, Riverside, has focused on the multitude of digital tools available and the challenges and risks of having young people sort through them. According to Joseph Kahne, CERG’s director, the rise of digital media has resulted in rapid fire dissemination of information to the public that can be both good and bad—it’s helped encourage young people to get involved in movements like #BlackLivesMatter and DREAMer, but has also spread misinformation. Kahne’s group has found that more training can help ease these issues, however. In one of CERG’s recent studies, students were 26 percent more likely to correctly identify accurate and inaccurate news stories after a course on media literacy, even if those news stories supported their preconceived beliefs. Teachers like Raybon are seeing these findings play out in their classrooms regularly these days. It’s their hope that if they arm students with hands-on learning opportunities, those students will become more active, informed citizens—prepared to vote, volunteer, and engage in civic life. Soon after the 2016 presidential election, Raybon taught a unit on bias and finding credible news sources. She gave students a variety of articles on climate change that represented differing perspectives—from The New York Times to Newsela to Breitbart—and instructed them to investigate the author’s intention and the facts available, and then form their own opinions. Raybon said she was pleased to note how many different viewpoints were expressed and respected during the lesson—a sign that when provided with the right opportunities, students can engage in civics and in informed civil discourse. After receiving positive feedback, she has decided to do another ELA project with a civics focus this spring, in collaboration with the social studies department and a local community organization.